Get in touch with your natural environment. This is where you will find balance, peace and inner strength. In this case, orca symbolism is asking you to get in touch with your inner self through meditation and soul-searching. In other words, all the knowledge you require for yourself is within your soul, and it’s inner guidance. Thus, like the catfish and seagull, you must learn to trust your instincts and allow your power to come forth. Therefore, the orca meaning insists that going inward at this time is the only way in which you will be able to move forward right now. Moreover, orca symbolism is also letting you know that you need a depth of self-understanding along with a clear intention to attain your current goal. People with the orca totem are highly intelligent and have great learning abilities. They never make the same mistake twice! Like the jay, this learning capacity, along with their adaptability, enables them to take on the most challenging of assignments and projects in life. Folks with this power animal always know that they will be capable of learning whatever it is they need to. This gift will consistently allow them to succeed with their current goal. They also know how to use their voice to get what they want in life. People with this power animal are always closely connected with their inner selves. They know how to stay on track with their life path. When you have a Killer Whale or orca dream, it indicates that you need to be more social or more vocal about something. In other words, step up and speak up. Alternatively, the dream can also symbolize spiritual guidance. Thus, similar to the sea turtle dream, the vision is letting you know that you are ready to confront your emotions. It is important to realize that the best way for you to deal with these emotions is by making the connection between your conscious and subconscious self. Occasionally, when you dream of a breaching killer whale, it is a message that you have due cause to celebrate. Moreover, you have finished with the problematic inner emotional work for the time being. For the past three years I have had an increase in orca fascination, anything about orcas would grab my attention. Then the fascination died down a bit and in that time I started dreaming about orcas. Those that I can remember have always puzzled me until something in life happened to sort of explain the dream, as if the dreams were a type of warning or guide for things that were to come. For example, before I found out that a family member had cancer and that another member had to go for heart surgery, I was constantly dreaming about orcas helping and supporting an injured member of their pod and sometimes I would be a part of the pod that would be helping the injured/sick/deformed member. When family passed away the dreams would be about orcas that go off on their own, or they get stranded. Then I would be dreaming about orcas that are always out of my reach, like I’d be watching them from shore or from docks, or even from my bedroom window. That’s when I started applying for work and when I found the right place for me I had a dream about a superpod and about orcas in celebration at the bountiful fish in front of them. I sort of accepted that when I orca dreams started I would prepare myself for something that was bound to happen in life. for the last few months the dreams slowed down, or would be few and far between. My fascination with orcas is still strong but the dreams are now maybe once a week, and they haven’t been warnings. Why was I not warned about a loved one that passed away, why was I not warned about people around me getting sick? I don’t understand anymore. Can someone help me? Again sorry about the long story. I’ve just had a dream where I saw a single Orca trying to kill me by attempting to grab my leg from the window (I was hiding in some kind of house but the ocean was right next to it and I was forced to close the window shut. I knew I was terrified at that moment. The Orca then tried to break the window by biting and tapping on it, he succeeded to open it once but I made haste to close it. I was also on my phone trying to find out how to scare him away, I somehow knew that making orca sounds would scare him off? It made him hesitate but after a moment he resumed his goal in attempting to kill me. I personally know, from documentaries, that Orcas are extremely hard-working and can even chase a whale and her cub for 5 hours. This single Orca in my dream seemed to be there for hours. I didn’t leave the window area of the house because I felt that if I did, the orca would come right through the window and find me. Before the whole fiasco with the orca trying to kill me, I’m quite sure that I was watching that same lone Orca jumping out of the water, putting on a show of his own. I felt mesmorised by that moment. I also dreamt of 5 lions, one was had a normal coat, one was white and the leader was black. (I can’t remember exactly what the other 2 lions’ colour of coat was) They were also trying to hunt me down. I was also running away from people that wanted to harm/keep me. I know this isn’t related to orcas but it was all in the same dream. I dreamt of a pod of orcas, but they were swimming in the air like in Fantasia and it was occurring in my childhood living room. The baby orcas came up to me with encouragement… then I noticed a ring, I picked it up and attached to it was a proposal from my twin flame. He finally admitted that he wanted to be in union, after all this time fighting what we both couldn’t ignore. My heart began to sore…. It’s interesting as in my waking life I’m not all that fascinates by them. But they keep appearing in my dreams. I’ve swam on the back of them they’re soo intelligent and understand me. Last night i dreamt one which seemed younger as he wasn’t so large. But he kept crying for my attention like a baby almost. All he wanted was me to hold his face against my chest. It was amazing I woke up feeling so happy. But i feel like they’re trying to ask us for help. It’s interesting as in my waking life I’m not all that fascinates by them. But they keep appearing in my dreams. I’ve swam on the back of them they’re soo intelligent and understand me and just seem to communicate without effort Last night i dreamt one which seemed younger as he wasn’t so large. But he kept crying for my attention like a baby almost. All he wanted was me to hold his face against my chest and play. It was amazing I woke up feeling so happy. But i feel like they’re trying to ask us for help. I had this dream 2 years ago that i was standing alone in a shore and i saw this creature swimming towards me with very fast speed. And it just went right through me and suddenly i woke up. I still remember this dream to this day and it sticked to my mind and after looking up different sea animals i’m 100% sure it was Orca. Could this mean that orca is my spirit animal? Im going through a very exciting and interesting time in my life, goals and spiritual understandings, very open and welcoming for everything. The other night i found myself in my dream, in a small fisherman boat, here where im living (Panama btw), everything felt familiar, i was happy and pleased with love and light, i felt a huge mighty force, and an Orca appeared by my side the litte boat, he peaked his nose out… and disappeared, i started giving him some of the fish i caught… felt silly cause he can catch much easier than me, but sharing, and becoming friends… i took my time, spoke to him, introduced myself, started confronting him with my thoughts and mind… until i tied a huge loop in my ancor rope, and threw it in the water, next thing, my friend (called him timmy cause he was funny), started to drag /pull/ lead me, engine out of water, we were going like speed boat fast, i couldnt stop laughing, cause it was just funny and yet not surprising in a way.. haha, i was scared he would become real playful and splash his fin…but he just wanted to take me somewhere, and i didnt make it to the end- where…. so…yeah…any ideas what to learn here? i was honored by his presence and conforting feeling. Hi Hope, it might mean that whatever you are going through in your life right now, it is essential for your survival that you embrace the power that an orca or killer whale represents to you, or any other qualities that you associate with them. I would write a list and see what comes up, or read more about them to find out more. The people around you who are telling you, you are not supposed to kill them, might be people in your life, or unconscious aspects of yourself that do not want to see you empowering yourself. Part of this empowering process might also mean having stronger boundaries. Maybe a part of you sees this process as illegal or threatening to yourself, because you have not played the powerful strong role, strong boundaries person before. I’ve had dreams about an Orca. It always seems to be just one, he/she is never with their family for some reason. Its hard for me to remember all the details of these dreams because I rarely remember a whole dream once I wake up. But what I can tell you is that the setting seems to never stay consistent. Sometimes its a pool, sometimes its an ocean. Sometimes its hot sometimes its arctic, but it seems to be the same Orca every time. A young Orca a little older than a baby but definitelly smaller in size than an adult. The detail I remember most from the dream is hearing him squeak at me and behaving like he was trying to communicate to me, but is frustrated because I cant understand him. Im not sure what that whale is trying to say when i dream of it. But what I do know for sure is the way I feel when I see an picture or a video or even a painting or a stuffed animal that looks like an Orca. I feel a sense of comfort, I feel happy, and I feel I guess just a sense of awe. Im not sure what to make of the bits and pieces of the dreams that I remember. But I have always been a pretty sensitive guy. Im a fairly big dude who looks like a typical “manly man” but ill be the first one to cry in a movie. I dont know if the whale is trying to tell me its okay to be sensitive or what. I honestly dont know. Hello loved this article. Im always having dreams of an orca sometimes im walking on a bordwalk and it fallows me were ever i go on it or any place it can see me or something like that or in the water swimming and playing with it. But im always haveing fun and very happy with being with it. It as i can remember is not to big and from the fin shape i think is a female. Not sure. And when i was a kid my mom for a Christmas gift got me the free willy 2 vhs that came with the limited edition orca Tottom necklace . I went out to play in the snow and it fell off and i could never find it. Then few years later living in Florida (i was living in NJ when i lost it) i come home from a friend ‘s house and there on the kitchen table there it sat. The very same necklace i had lost when i was a kid. Here my youngest brother found it on the ground coming home . He had no idea what it was.so i told him about it,and about the one i lost . So i told him to put it somewhere safe. And here he tells me that he was going to give it to me for my birthday which was just afew days away. So it had come back to me. 🙂 i still have it. To this day. I took a bath with yemaya salts. As I sat in the water, I felt the need to cry. The next day while on the bus heading home from work, a vision took my attention. It was an orca swimming up and down in the water. I asked it’s name because I knew it was a whale but I didn’t know what kind of whale. It told me it was an orca. I looked up orca totem and it is accurate with what is going on with me now. I think you all are blessed to dream and see. I see a lot of things through open visions. About ten years ago, I was standing on a shore and an orca immerged from the water, gingerly bit down on my jacket, and pulled me into the water. As dogs sometimes do, the orca held me in its teeth and submerged me as if it were caring for me. I felt no fear and only a powerful beast taking me beyond. It was in the midst of a divorce and the grief of losing the dream being a family. I’ve never really known what to make of the dream, but it still impacts me with comfort. I have had a similar dream but I had to follow the orca through a tunnel deep underwater, at first I was scared but I could breathe and then I felt calm. I think it means that I (and probably you) had to connect to your higher self to take you through to your next journey and as unsure as it seemed it was going to be fine. Trust yourself that you will be fine. It has been known that female orcas have often carried their dead infants gently in their mouth or toted them above their head to get air for days or weeks on end in mourning of their loss. A divorce is very much like a death in its loss. Especially in your ideals of losing the idea of having a family. This mother Orca was definitely mourning with you and Giving you so much love. She was honoring your loss. 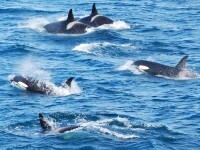 I just woke up from a dream about a pod of killer whales! I was in a speedboat out on the ocean and orcas were zipping by the boat. I put my hand out and they ran their heads under my hand so I was petting them. I was also playing with their teeth. It looked like they were sort of smiling. There were other schools of large fish near the boat too, but the orcas were closest. They were so beautiful and SO much fun! I haven’t had that much fun in a dream in a long time. I dream about Orcas every now and then. In some dreams I travel to remote places to see them up close, even going in freezing waters to find them. Sometimes I see them (in my dreams) in parks a lot like sea world, but they are either breaking free and jumping into the ocean or I am late for the viewing shows, or the pools are filled with dark, dirty water and I can’t see them. Sometimes I’m by the beach and they swim too close to the shore and they scare me. A few times it’s been just a baby orca, in a pool, and I know it will die because it’s not a proper place for her to be in and I try to save her. Sometimes I go in the Orca pools and swim, like trainers do in sea world, but I want our fast because I’m scared they will eat me, but I’m fascinated by them and I love them. The other night, I had a dream that was very different from other dreams I’ve had. Rarely do I have dreams that involve animals, so I was surprised when I woke up. In the dream, I remember standing on a thin piece of iceberg that was afloat in the middle of an Arctic ocean. Some sensations I remember vividly were being cold, especially in my feet, and I was overwhelmingly sad. It was reminiscent of the sadness you’d feel at a funeral for someone you were close to. I was staring off into a sunrise, and it was cloudy and gray with a hint of soft purples. It sort of added to the melancholy of it all, but I kept watching the sunrise. Once the sun was up, the berg shifted in the water, and there was an orca just circling me. After a few revolutions around, more and more started to show up. It felt like the entire ocean was full of them, and they were all squeaking and making noises at me while they swam in circles. I thought it was weird that I wasn’t scared, because surely you’d assume a massive animal circling you would want to eat you, right? But all I felt from them was some sort of weird comfort. My overwhelming sadness since the dream started, was finally lifting a bit. The orcas stopped swimming after what seemed like hours, and they all turned to look at me. They made no sound, no movement, nothing. They just stared. The sun was starting to set by then, and I remember watching the gray-scale sky turn that nice soft purple again. The orcas looked like they were blending in with the water, and all I could see were their white spots. I decided, after a while, to jump in with them. The second I did, I felt a rush of cold all over my body, cold enough to wash away anything I felt, and then I woke up. I’m not sure what sort of meaning that dream had for me. I just know that I felt deeply sad when I woke up, and I’ve been weepy and crying a lot since then. I found this page by coincidence, but since people were sharing their dreams, I thought I would too. Thank you for reading, if you did, because I felt a nice weight life off my shoulders once I finished. Wow, that’s very powerful and beautiful, thank you for sharing that. Dream interpretation is personal, but that sounds like a healing dream to me. In my dream I was sat in what I think was a classroom but I was in America somewhere possibly Florida. It was very stormy outside and next thing, I look out the window and see a baby killer whale being pushed and battered around by the wind. I ran outside, and found the baby whale stuck in a ditch not moving. I poked it to see if it was still alive. Just as I thought I had been too late it moves and makes a high pitch screech. Relieved, I managed to pick it up ( damn thing was a lot heavier than expected!) and as I picked it up it tried to bite me but I had to take it inside for shelter. Once inside the whale seemed to calm down. Then my mission was to find a pool somewhere big enough to keep it safe. However, it the end, no one seemed to be able to help me and the only solution was to buy my own pool to keep the baby whale in until the storm passed. I would like some help on getting some understanding on a dream I had last night. I dreamt that I was driving down a road on a bright sunny day. The road lead to a left and right turn only. I don’t remember where I was going but when I made the right turn it was based on assumption that it was correct. As I made the right turn a rod came down horizontally to block oncoming traffic like a railroad crossing sign. I made the turn just in time to avoid waiting. Now I notice the ground was part ice transitioning into water. I quickly turned around and now I’m on foot and trying to get out of the way or whatever might be coming so, I moved to the left. As I turned around to find out what the barrier was for, I saw an ocra jumping out of the water and nearly hitting me. I moved closer to my left where I was against a wall of rocks, still standing on ice.The ocra saw me and tried to attack me. I jabbed it a few times in the face until blood shed. I felt cornered and eventually, the ocra managed to jump onto the platform I was on and I woke up. My main feeling throughout this dream was fear. I dreamt about Orcas last night during the full moon. I was dreaming about something else when I heard screams out in the water. I looked out into the Puget Sound to see a group of onlookers on a boat, watching Orca whales attacking people in the water. They were throwing the dead bodies up into the air like seals. And holding the dead under the fins as they spun around, almost like they were trying to make sure the onlookers could see them, and to cause more fear. They treated the dead bodies like trophies. Then they came after those of us on the beach. People were trying to touch them but most of the time ended up being caught in the mouth of an Orca. I told those people to get out of the water but was ignored and told I was acting like a parent. I watched a video yesterday about how our shadows are coming to the surface because of increased energy (solar flares and such) on earth…I’ve dreamt of Orcas a few times but never have they been violent in my dreams. It felt like they were getting revenge. Maybe this dream was triggered by the recent death of Granny from J Pod our oldest Orca here in Washington, as well as the recent death of Tilicum and the closing of sea worlds whale show. But wow, what a disturbing dream. I wish I could understand it a bit better but right now I feel like I am in shock. I’ve always loved Orca whales since I was a child. I was obsessed with Free Willy and Sea World. Growing up I alway said I’d be a marine biologist. As an adult, I’m definitely not trying to swim with whales anytime soon, but they will always be my favorite animal. I’ve begun having this reoccurring dream. Each dream scenario varies, I could be at a water park or I could be watching the situation on a tv. First the orca is presented to me and I get really happy. I find it adorable and just get filled with joy. But shortly after I’m introduced to it, it violently kills another, smaller, orca in front of me. Rips it to pieces, water clouding with blood. And I’m horrified. But the people I’m always with in the dream won’t let me leave the area or look away. They continue watching like nothing is wrong. It’s always so gory and awful. It scares me. What could this mean? I was floating in a bay at night, naked, the water was calm and there was a full moon so it was very light and clear sky with lots of stars. Suddenly i felt something big under my feet and i was lifted out off the water standing on a killerwhale. I looked around and saw all kinds of marine life: seals dolphines all kinds of fish and otters. I felt like a king it was fantastic! After a while a flew away above the bay to land and watched the full moon. I’ve never been so happy as in that dream! I dreamed I was suspended from something like a hang glider or big kite and headed toward a big pool of water. I was worried that I would drown. Suddenly off to my left I saw a big orca in a huge white plate. The water was shallow in the plate and the orca suddenly swished its huge tail and a wall of water came rushing towards me then I woke up. I have also dreamed about other sea creatures, very weird dream. That dream was a series of dreams. In the part with the sea creatures I was sitting down watching a group of sad shuffling poorly dressed black people. They were dressed like pictures I’ve seen of slaves. Suddenly dolphins with their bodied disentegrating behind them began rushing down toward me from the sky. I was so scared. Then the old black woman in the front gave me a sad look and said telepathically I know you don’t understand this but you will soon. Also when I visited Paris just taking tourist photos I saw what looked like a dolphin flying in the sky when I examined the photos later. Neither myself or my spouse could identify what it was and I had two pictures from different shots. It’s actually quite normal for me to have extreme detailed and strange dreams with lots of symbolism. I wish I knew what it all meant but I don’t. 🙂 Hi I had a dream lastnight that I was in our new batch on the water and we had a hole in the floor open to the sea, and when I looked deep into the water a orca appeard I then reached to touch it and then a whole lot more appeared it was amazing I could talk to them and feed them it just took my breathe away, it felt so peaceful and I enjoyed ever moment of it. I woke up telling my mum about it. I really felt there was a message for me from this dream not to sure what it was but I’m So greatful for finding this site.. love and light ?? I just had the most amazing dream about an Orca. I was on a ship and saw a man jumping overboard towards an orca swimming past. I then realized that I am that man and swam next to the orca. There were no fear whatsoever and he let me ride on his back. I could also speak to him and he told me that I must hold on as he’s going to jump high out the water. At one stage I was softly stroking him and realized how sensitive he was to touch. I’ve never dreamed of an orca before and also never saw one in real life. This was a dream I will never forget. I’m not sure that orcas are supposed to be positive dream symbols as I have now had 2 dreams featuring them and both were very scary. First one, I was on an inflatable float being pulled behind a boat with my whole family, having a good time and enjoying the speed. I kept dunking my head under to see underwater and then I noticed a pod of orcas coming up behind us. The same way dolphins sometimes swing with ships. I was like “oh wow look at all the orcas!” And put my head under again. My mum put her arm around me shoulders and pulled me back out of the water, saying “J they are killer whales!” And just as she did I narrowly missed being bitten by one orca. Then we were trying to get the people on the boat to pull us in but they wouldn’t. In the second dream I was in the water, I thought of a swimming pool but I’m not sure. Water was murky. I was with 2 people, I think my mum and sister and I was floating on a lilo. An orca popped up and looked at me and at first was sort of messing around, bumping into my legs etc. Thing was I thought even if it’s being playful I wish it would stop because I still don’t like it. It wasn’t doing this to anyone else. It was getting harder to stay floating flat on the water but I was aware that I didn’t want to be upright as too much of me would be too deep into the water. People with me said it was just playing so I went upright and it came up and tried to eat me, had its jaws open around my shoulders and head and I put my arms out and pushed it’s mouth open and pushed it away but I was very scared and I think it did want to kill me. I think at this point my actual knowledge of it being stronger than me kicked in within the dream and I just really wanted to get out of the water. On a side note I really don’t like dolphins and orcas they make me uneasy in real life as well. I had a really random dream last night about aggressive and attacking orcas. My dream: My little sister and I went to an “open ocean” protected marine wildlife center in Monterey Bay and it was supposed to be a place where we could touch orcas and see them up close. As we walked out onto a ledge, an orca came up and I believe that we touched it momentarily. Soon after another came, and this one tried to attack us. We ran but the orca actually jumped out of the water and onto us. I was so concerned with trying to protect my little sister so I kept trying to get between her and the orca. The orca then bit my foot and tried to pull me under. We got away, but only to another area where there were more orcas who were trying to attack us. At this point, my little brother entered the dream and we were all trying to get out of this marine wildlife center but 4 orcas were circling us and continually coming out of the water, trying to bite us and bring all of us in the water. I was terrified and mostly concerned about trying to protect my siblings. We eventually made it to a safe area, and the trainer of the center all of a sudden appeared in a fluster to apologize and to let us know that the area was safe. I argued with her and felt like I needed to escape the center with my siblings. We all got away. This was so random of a dream and I have no idea what it all means!? Any insight would be great. To all the people who feel they belong with these whales, it is possible that you have switched from whale soul to human on life’s evolutionary path. The longing, the memory, the dreams indicate past life memories. Whales and dolphins, like humans choose to be reborn to experience life again. In my dream last night, I was back in my hometown where we have a basin that flows out to the Bay of Fundy. I was showing my fiance around town, and we had taken a tiny boat in the basin. It flipped, luckily we had flotation devices attached to us. So we started to swim toward shore. All I could think was, sharks are going to be attracted to us (there are no sharks in the basin that I am aware of), we float up to the side of what I think is a sunken ship (strange) and hold on to the side to rest. Out of nowhere an orca comes up to the surface right next to us. Spy hopping in and out of the water, checking out what we are. Then, three more come to the surface, and are circling us. I am a little fearful, I have heard that an orca has grabbed it’s trainer by the foot and dragged them under (I despise that they are still in captivity). But they showed no harm to us, only curiosity and playfulness. We floated and watched them, when one came right up to us and allowed us to touch her on the head. She had a young calf who had no real interest in us, only what the other orcas where doing. This dream went on for quite sometime, with us floating and watching them. Sadly near the end, they all went under and came up before swimming away. What was sad, they had black oil coming out of their mouths. I tried to wipe it off one of them, but then they swam away and I woke up. Our magical beasts are and have been in danger, I think this is what my dream represented. I have had many dreams with them. One in particular I am at my cottage on a lake, watching fish swim under my dock and come out as orcas on the other side. Magical. I had a dream tonight about an orca. I was standing in the audience of a water show and a trainer was telling people that the orca was about to show up. The trainer’s younger brother (just a child) was there too and he didn’t listen to his older brother and so he didn’t get out of the pool. A trapdoor (circular/spiral) in the bottom of the pool opened up and the orca came through it. She went directly to the younger brother and took a bite from his right foot, biting his toes off. As a punishment, some security guys pulled the orca to land, up the stairs that divided the audience seats, to a platform above and behind the audience seats and they killed it. Everyone in the audience got blood on their faces and clothes. Two young women ran towards and then past me, very scared, one was black, the other was white but they had the exact same hairstyle and they ran with their arms as interwined as human arms can be. I looked to my left shoulder and i had blood on it and I looked to my right shoulder and I had blood on it too. I was a wearing a pink woolen sweater. Last week I had two odd dreams within days of each other. The first dream was of me milking a venomous snake with large fangs of its venom into a jar. I was not afraid. Two days later, I dreamed of standing in a nondescript place and this orca kept leaping into the air over and over and over, splashing me with water over and over and over. I was very intrigued by the dream and the fact that I’d been dreaming a lot about animals and also forms of water. It is all very exciting and odd for me. Thank you for this article and allowing people to respond. I didn’t want to respond at first. But when I did it brought me to deeper (self) realizations. I guess that’s just how Orca works when you respond to its call. May you also continue to listen to your deep inner call to soothe the same calls in the souls of others! I have had dreams of or as for a year now. The first one I was in a building and was searching for something/being drawn to something and entered a room with a large pool in it..the shape of a jelly bean. In the pool of water was a female Orca. As I walked from one side of the room to the other she followed me making eye contact the whole time. I was frightened. I felt that if I got in the water she would take me under. ( im not sure if I feel fear of death or fear of unknown.) I hide partially behind a tile pillar but still holding the eye contact. And then out of no where a little girl in white with white soft hair and glow placed her small cool hand on my forearm and said in a voice so soft I wondered if she had spoke in my mind. ” Its time” and its as if I knew that it was and I was afraid and the pull to the orca was so strong. Then I woke up. Any ideas? They all havr this feel to them… real but not… memory but not. I just had a dream of an orca being hacked to death on a boat. Don’t play weak and small, when those who threaten your space, pull on the majestic qualities of the Orca that you are too “decent” to embody. The Orca is a symbol of Yin and Yang principle of life – that being said we all have light and darkness in us. How you use either light or dark to draw power from is up to you. And sometimes what you perceive as “dark”, by being too decent and ashamed to stand up to people “bullying” you for example, is actually a warrior trait of Light. Putting the shadows in their place. Never be ashamed to stand up against injustice. Because that is maybe just what the overall yin-yang balance need to be restored in the Universe. Thanks you for this. Yes, the Orca in fact represent the balance as does all dolphin species who live in the realms of both air and water, the two never meeting or mixing but always in balance with each other. this is reflected in my peoples teachings of the thunderbird and the water panther. Orca is only one of a few beings with both white and dark markings. teaching us of the balance of light and dark. Similarly, my west coast peoples who I honour, since I was gifted with my medicine(Haw’t sa’ we) or Dolphin, or Orca)by a west coast elder, have a similar story of the thunderbird and the orca locked in battle, good forces opposing bad, creating balance in all things…all is as it should be. we cannot control any outcome, as the elders have taught me that the outcome has already been decided. It does not mean we do not attempt to use our will to make change. It is the will that created or manifests out destiny. fate cannot be controlled but destiny can be manifested. I have loved orcas since I was a child. I grew up watching free willy three times a day, every day. 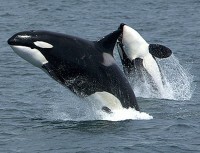 I still love them, I literally cannot watch a video of an orca without tears in my eyes. I respect them more than humans I think. I don’t know anything about totem animals or how one would determine what your totem animal is… But I keep having reoccurring dreams about orcas. It’s always the same dream, in this dream it looks like I’m on the west coast of Canada but I know I’m not. I’m walking along lake ontario (funny I know) and all the sudden a pod of orcas surface right along the beach, I think they are rubbing on stones on something. I run out like knee high into the water and I’m completely beside myself, I can’t believe its happening. I don’t touch the whales but at some points I’m pretty much swimming with them and this goes on for a while until they swim off or I wake up. I’ve had this dream several times in the past year and I can’t make sense of it. It’s obvious I love orcas but does it have a deeper meaning? I feel like they call to me, I don’t know how to describe it but I’ve never felt so much passion for something I’ve never really seen or felt before. I have tears in my eyes just writing about it. I would love some insight, or guidance on how one determines what their totem or spirit animal is. Thank you! Hi, with honour and respect I ask you- why is the Orca so precious but the fly that you kill without thinking is less precious? This happened to me too and I initially feared the Orcas because I could feel their immense power and it scared (and excited) me, especially in those dreams where I had close contact or was in the water with them. I had a breakthrough in one dram where there was a massive male orca and he was kind of my protector and made me feel safer. He let me ride on him and lay on his belly while he floated on his back. I got this overwhelming feeling that he was slightly amused by my fear and was trying to communicate that even though he could easily drown/kill me, he would never do that and would actually help me if I was in trouble. Gentle giant is the phrase that comes to mind. Once I reached that point, I felt great joy and elation whenever I dreamed of orcas, although I haven’t met that same orca since… By the way, my main totem/spirit animal is the owl, so I initially felt resistant to accepting another spirit animal guide too. We have more than one and they guide us in different areas of our lives. Having an orca visit you in dreams is a huge honor and if it’s any comfort, the fear you might be feeling, might be coming from the water (which symbolizes life), rather than from the orcas. They’ve always appeared in my dream as a child growing up , and its been on and off . Now the Orcas back .. would you consider this my totem? .. as a child i was memorized by marine life and when i finally had learned about this animal its kind of made its appearance in my life more then once in many different ways aside from the dreams. I was 13 when I started to know my spirit totem as Orca after an eye opening trip to Marine Land with my school. I had seen the movie Free Willy several times when I was a child but I didn’t know very much about them or the extent of their struggles. When I cam back I was crazy about marine life and I wanted to do everything I could to protect them and their habitat. I wrote a research paper on it for a class assignment and I know I spoke about it more then many wanted to hear. It was difficult to get people to care when they didn’t live near the ocean or felt they had no real impact on environmental change. For me though it was very personal. In my high school art class I painted a picture of a beta fish in a bowl that was too scared to come out and face the open waters. High school was a very difficult time for me and I battled with a constant deep sadness. I fought to find myself again in college and was rewarded with dreams of flying across Canada as a bird to the west coast like I was migrating home. In my dream I reached a cliff and did a running jump off of it. At first I thought I was falling and I was afraid as I approached a layer of mist and fog then somewhere in there I started to dive and as I breached the water I was finally at home in my element. The ocean was filled with light and colour and I could see everything. In later dreams I made similar journeys to the Pacific and once an Orca showed me large painting of his ancestors on a rock face. I had the sense he was teaching me how to learn from my family’s past to create a better future for myself. Not long after that (I was 23 by this time) I went on a trip to Vancouver and I saw a painting with that same image at a street market while I was there. I didn’t purchase it, I already had such an image permanently etched in my mind and some else may have needed it more than I. This is my honest story of the Orca -a creature of communication, curiosity and playfulness. I hope it speaks to you. I’ve got a question: Do you feel like you need to go somewhere? Like a longing to find where you need to be still? So it means your deep inner self is going to come to the surface. It might be beautiful to you, but not to those in the world who do not appreciate true beauty. Maybe it is about going on a Solo journey and Finding yourself, in attempt to love thyself and make peace with the self in the glory of thyself. And doing it gracefully so, that others would consider you a leader for conquering the self in solitude which they fear. I know whales travel in pods but there is a solitary aspect to them… especially when they get stranded alone and die alone. I believe this type of spiritual tramsition can be accomplished only by the self. Sorry for the typos: the two words “sharing and transition”. I believe that is the whale totem’s main purpose – challenging people to reach the deep reserves of their souls to become the strong and invincible person they deeply wish to be. I came here to read comments to get a better understanding of why killer whales are in my dreams. I do not think they are my spirit animal. I feel a wolf is my spirit animal. The dreams I have had about killer whales frighten me. In one dream I am in a newly contructed buliding being built and I am looking down at the ocean that is underneath me and in the water are couple of whales swimming around aggresively. In my dream I am in shock. My other dream I am on a tall bridge highway in a car driving and below me is the ocean. I can see killer whales swimming. Again ,in my dream I am frieghtened. My other dream I am in a nature like area where it appears to look like a pool. The water is blue in color and I see killer whales coming. Im feeling a force like energy wanting to push me into the water and I am so scared because the killer whales are real close by. Im scared their going to get me. Well those are my dreams. I think their neat creatures. They are the wolves of the sea. I dont understand them. I not very excited to see them in my dreams. Im thinking that I hope I dont dream them anymore because I dont like the anxiety it gives me when Im dreaming of them. Just wish I knew why. Hey, as a prophetess of the Lord, sounds to me that you have rejected your spirit totem. 3 times the Lord has let you know that he is the source of all that is good and powerful as well as plentyful in the land and three times you have rejected the possibility. By rejecting the whales instead of communicating with them. Do you read your Bible? IN the Beginning the first thing God ever created was the whale. They belong here and God communicates through them. Embrace them and ask them what do they want from you? Sounds to me that you have fear issues, and the Creator of this Universe Love=THe Love of the Most High God, cast out all fear. Trust that he has you and let your Totems help you through this Process you will be glad you did. Then you will not only trust the animals you will respect all that God made:). Heads up, most of us have more than one totem, they come at different levels of spiritual maturity in our lives. You gave an excellent answer on this site. It takes time and a very precise course of study to stand in your type of spiritual knowledge with real confidence. Within the context of Americam culture it can be a very long slow process. I believe that everyone has the right to practice their own spirituality in their own way. There is no right or wrong way to practice your own personal beliefs. I believe that this world is about learning unconditional acceptance, and by embracing that, we will all grow into our full potential. Everybody seems to feel a force pulling them with the Orca totem. Maybe you are feeling yourself being pulled by your Deeper or Higher Self. And maybe you are afraid of your Higher Self, symbolized by the water and creatures of Depth, that you perceive as Death and a Threat. Maybe you should make peace with yourself, and use your destructive or Dark Qualities for a greater purpose. But don’t mistake masculine and strong qualities as something evil and weak to be despised. You are afraid to be powerful, to join the wolves of the sea, why? Embrace your power. As my dad taught us when deep sea fishing and swimming in the Ocean: Respect the sea and it shall respect you. Furthermore it also goes to say: respect the laws of Nature which includes Yin and Yang, it might just save you!! Wolf-represents Humility and Compassion. The wolves haunting howl represents the “calling” to walk the red road or the spiritual journey. Wolf is one of the most gentle beings on earth, and is known to my people as being the one who teaches us to live peacefully among ourselves. I’ve had reoccurring dreams about killer killer whales for years and only just decided to find out what the dreams meant. I’ve always thought they were beautiful creatures but never thought about them enough to justify why I dreamt about them so often so that’s why I believe orcas are my spirit animal. A Dream about an Orca is usually a call from either Beyond or your Deep Inner self to awaken the deeper spiritual self, especially when it is needed in Warrior Mode of everyday life. I have always loved orcas since I was a little girl, I even got an orca tattooed on me when I was 18. Ever since I was 6 I’ve always been fasinated with orcas. I can’t believe they’re my totem. It’s all me. Even the dreams. I believe I’m adaptable, intellegent, creative and such. I know I need to be more social. Amazing, my favorite animal is my totem.